Many online poker players dream of one day competing in the biggest poker tournament in the world, the World Series of Poker in Las Vegas. Well, Juicy Stakes Poker is making it possible for some of its players to fulfill their dream! Series 2014 satellites, now in play all day and night, are giving players a chance to step up to Sunday $1500 Finals ($30 buy-in) for as little as 30c. Top prize each week until May 25 is $1500 cash to spend in Vegas or wherever. 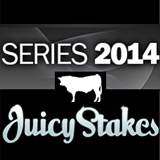 Juicy Stakes offers Texas Hold’em, Omaha and Omaha Hi-Lo ring games and tournaments. Its new no-waiting “fast fold” tables are increasingly popular. So is its 200% welcome bonus that gets new players started with up to $1000 in bonus cash added to their first deposit. Every month Juicy Stakes gives away $20,000 to its top Frequent Player Points collectors and regular players can now take advantage of drastically reduced withdrawal fees.